Sony Pictures held a brief panel at Comic Con Experience 2016 in São Paulo, Brazil where a clip from Marvel’s upcoming Spider-Man: Homecoming was screened. Though we don’t have the clip itself, Marvel’s own Ryan Penagos recapped the clip on Twitter, revealing a special upgrade to Spider-Man’s suit from the film inspired by artist Steve Ditko’s original costume design! There’s a case from Tony Stark with an “upgrade” for Spidey. 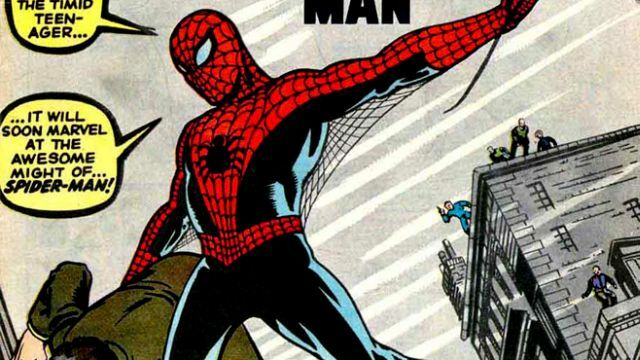 Then we see Spidey leap off a building, open his arms, web wings! #ccxp2016 2/? Spider-Man: Homecoming stars Tom Holland as the friendly neighborhood Spider-Man along with Marisa Tomei as Aunt May, Robert Downey Jr. as Tony Stark/Iron Man, Jon Favreau as Happy Hogan, Michael Keaton as The Vulture, Zendaya as Michelle, Logan Marshall-Green as a secondary villain, and Kenneth Choi as Peter’s high school Principal. The film also features Donald Glover, Martin Starr, Michael Barbieri, Laura Harrier, Tony Revolori, Angourie Rice, Jacob Batalon, Tyne Daly, and Bokeem Woodbine. The film was written by John Francis Daley and Jonathan M. Goldstein, composer Michael Giacchino will score the film. Directed by Jon Watts, Spider-Man: Homecoming will debut July 7, 2017.